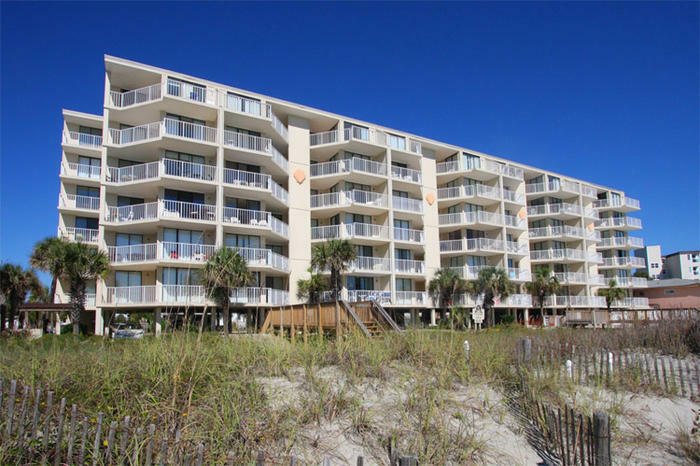 The three-bedroom North Myrtle Beach rentals have three baths so all six or eight people in your group can spread out and enjoy their time at this North Myrtle Beach resort. There is plenty of space for everyone in these condos at Crescent Sands of Windy Hill. There are two baths in the two-bedroom North Myrtle Beach vacation rentals and that is perfect for the four people who are accommodated in those North Myrtle Beach condo rentals. Choose a North Myrtle Beach condo at Crescent Sands of Windy Hill that has a fireplace. When you spend your North Myrtle Beach vacation at Crescent Sands of Windy Hill you will be close to shopping, dining, live entertainment theatres and Myrtle Beach golf courses. So many things to occupy your time during your North Myrtle Beach vacation and so little time to fit it all in during your stay at Crescent Sands of Windy Hill. Shop until you drop throughout Myrtle Beach where outlet malls are a favorite for bargain hunters and waterfront shopping venues also vie for your attention. Tanger Outlet Center has two convenient locations that are full of stores with your favorite name brands. Barefoot Landing is located on the Intracoastal Waterway and is where shopping and dining combine in one amazing venue. Shop a few hours and then get something to eat at Barefoot Landing. And if you are there later into the evening you might check out who is playing at House of Blues and what time performances start at the Alabama Theatre. Broadway at the Beach is a similar shopping and dining destination located at 21st Avenue North in Myrtle Beach, South Carolina. Ripley’s Aquarium is there, the Palace Theatre is nearby and the beautiful baseball field where the Myrtle Beach Pelicans play professional games is right across the street. There are more than 1,500 restaurants up and down the beach in the Myrtle Beach area. Seafood buffets, waterfront cafes, dinner theatres and restaurants on fishing piers are all part of the scene in the Myrtle Beach area. You can find most everything to eat and remember that the Lowcountry features such specialties as shrimp and grits. Seafood is on most menus for breakfast, lunch and dinner and there are raw bars everywhere in the Myrtle Beach area that serve seafood raw, grilled, fried, broiled, baked and steamed. Live entertainment theatres are plentiful in the Myrtle Beach area and most visitors enjoying a North Myrtle Beach vacation at Crescent Sands of Windy Hill go see at least one show while they are here. The productions are energetic and full of talent. Most are musicals with plenty of singing and dancing. It is not uncommon to see live animals and hear comedy acts as part of these productions. Pirates Voyage and Medieval Times are the two dinner theatres in town and Carolina Opry and Alabama Theatre offer nightly shows. There is also Legends in Concert and House of Blues nearby Crescent Sands of Windy Hill. Golf courses number more than 100 in the Myrtle Beach area. If you are a fan of hitting the links then you are spending your vacation in the right spot. Make a tee time and enjoy the natural beauty that the Myrtle Beach area golf courses feature. There are award-winning championship golf courses, lighted executive golf courses, par-3 golf courses and golf courses that boast 27 holes. Take your pick. Driving ranges, club houses with pro shops and lounges and private lessons from a golf pro are all offered at most of the Myrtle Beach area golf courses. Elliott Beach Rentals is not affiliated with onsite management or the HOA of Crescent Sands Of Windy Hill.